Before the actual post I will apologize for the lateness, so sorry. Black Cat by Kentaro Yabuki is a very good book. It is about a man named Train Heartnet, who used to be a "eraser" (assassin), for a company called Cronos which secretly controls 2/3 of the government. 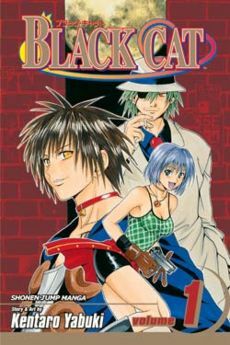 After a mysterious girl named Saya Minitsuka entered Trains life, he gave up being a eraser and became a "sweeper" (bounty hunter). Now it's a few years later and Train is working with his new partner Sven Vollfied on a mission to stop a man named Torneo Rudman from creating an all powerful bio-weapon. It/Her name is Eve, a 10-ish year old girl with a organ in her body that creates "nano-machines", little devices that able her to transform into most anything she wants to, with enough concentration. When Train and Sven are going to break into Torneo's mansion they run into a "self- employed thief for hire", named Rinslet Walker. They start working with her and that leads to an unexpected friendship with Rinslet and Eve. I think one part in this book that I found a little creepy is the first few times you meet Eve. Since Torneo raised her to be a killing-machine, whenever she's going to kill someone she goes up to them and asks them if they want to play tag. She'll say that, then she'll proceed to kill them shortly after. That always freaked my friends and I out, even enough that one of my friends said that she "Will never, ever, ever, ever, ever play tag ever again." (well, you know something like that).